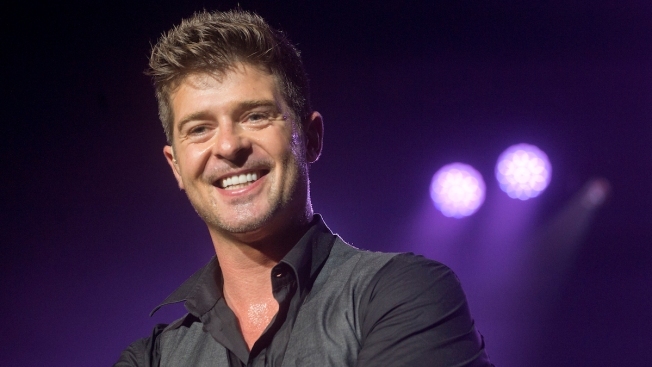 Robin Thicke to Perform at Downtown Chicago "Block Party"
The block party begins at 7 p.m. and goes until 10 p.m.
Robin Thicke will perform in Chicago next week as part of an outdoor “block party” downtown. The Renaissance Chicago Downtown Hotel will unveil its $22 million transformation with “The Happiest Hour” block party on June 11 featuring outdoor performances by Thicke, R&B artist Natalie La Rose and Chicago hip hop artist HXLT, the hotel announced Monday. The outdoor performances will line the Chicago River at the corner of State Street and Wacker Drive. The block party begins at 7 p.m. and goes until 10 p.m. The show won’t be the first time Thicke has performed outside in Chicago. In fact, his performance at the 2013 Taste of Chicago was noted for getting Mayor Rahm Emanuel's hips swinging.